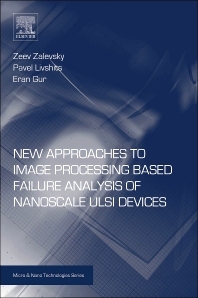 New Approaches to Image Processing Based Failure Analysis of Nano-Scale ULSI Devices introduces the reader to transmission and scanning microscope image processing for metal and non-metallic microstructures. Engineers and scientists face the pressing problem in ULSI development and quality assurance: microscopy methods can’t keep pace with the continuous shrinking of feature size in microelectronics. Nanometer scale sizes are below the resolution of light, and imaging these features is nearly impossible even with electron microscopes, due to image noise. This book presents novel "smart" image processing methods, applications, and case studies concerning quality improvement of microscope images of microelectronic chips and process optimization. It explains an approach for high-resolution imaging of advanced metallization for micro- and nanoelectronics. This approach obviates the time-consuming preparation and selection of microscope measurement and sample conditions, enabling not only better electron-microscopic resolution, but also more efficient testing and quality control. This in turn leads to productivity gains in design and development of nano-scale ULSI chips. The authors also present several approaches for super-resolving low-resolution images to improve failure analysis of microelectronic chips.